Any condition that irritates or destroys a joint is called arthritis. In a normal joint, cartilage covers the ends of the bones and allows them to move smoothly and painlessly against one another. With osteoarthritis (also called degenerative arthritis), the cartilage layer wears out and bones rub against each other. As the cartilage layer continues to wear out, symptoms of arthritis develop and the joint is eventually destroyed. In the hand, the second most common joint to develop osteoarthritis is the joint at the base of the thumb, or basilar joint. The basilar joint of the thumb is formed by a small wrist bone and the first bone of the three bones in the thumb. The shape of these bones gives the thumb a wide range of movement – up and down, across the palm, and the ability to pinch with each finger. Who gets it? Arthritis in the basilar joint of the thumb is more common in women than in men. It usually starts after age 40. Past injuries to this to this joint, such as fractures, sprains, etc. may increase the chances of developing this type of arthritis. The first symptom of basilar joint arthritis is pain during activities that involve gripping an object with the thumb and fingers (pinching). These activities could include opening jars, turning door knobs, opening car doors, and turning keys. Heavy use of the thumb may also cause pain in the basilar joint, as can changes in the weather, such as a change in humidity or temperature. As the disease worsens, less activity is needed to produce pain. Pinching strength decreases and swelling may develop with use of the thumb. As the arthritis continues to worsen, the basilar joint begins to look bigger and “out-of-joint”. At this point, movement of the thumb becomes limited. Diagnosis – Close inspection will sometimes show a lump at the base of the thumb that can be swelling in the joint or displacement of the thumb’s first bone. Also, forcing the thumb firmly against the wrist bone while moving the joint will usually produce pain and may produce a gritty feeling. The pain and the gritty feeling indicate that the bones are rubbing against each other. Early on, movement becomes more difficult, especially when sticking the thumb out to the side. In worse cases, as the joint wears away, the thumb’s first bone collapses into the palm when gripping smaller objects. The collapse of the first bone then causes the second joint to overextend when gripping larger objects. 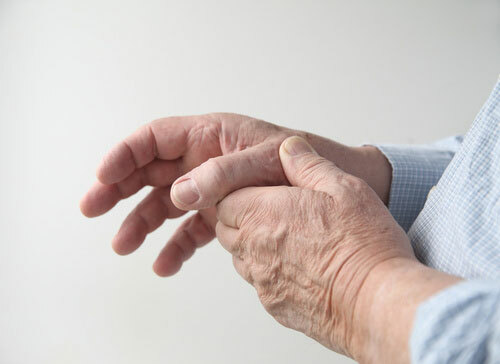 Treatment The pain of early basal joint arthritis will usually respond to nonsurgical treatment: limiting movement of the thumb (placing a splint on the thumb) and using medicine (oral or local injection) to decrease swelling and pain. Patients with more severe cases may require surgery. Your doctor can advise you on the best treatment for your situation.